If only limits were the goal. Does the hunt have any limits? At some point they will encounter the neutrino background and then they won't be able to continue with these techniques. As far as I know, no one knows how to get past the neutrino wall. Right? There is this idea of directional detection that may help a little. But certainly, once we hit the neutrino wall, it will become much more difficult to improve the limits. Muon, there's no such thing as a "neutrino wall". There's a signal of coherent neutrino-nucleus scattering, interesting in its own right. For the search of dark matter beyond that, improvements would necessarily slow down due to this signal being a background in the dark matter search. But Jester, there's no reason that it couldn't go on beyond that even without directionality -- after all, the Higgs was also discovered on top of a huge standard model background. Anyway, already these experiments are limited by severe budget cuts more than anything else. So Robert, no reason to worry, unfortunately. I expect that an astrophysical discovery will one day render the entire particle DM search moot. So I don't worry; I just enjoy poking fun at the true believers, whose faith has been greatly tested lately. 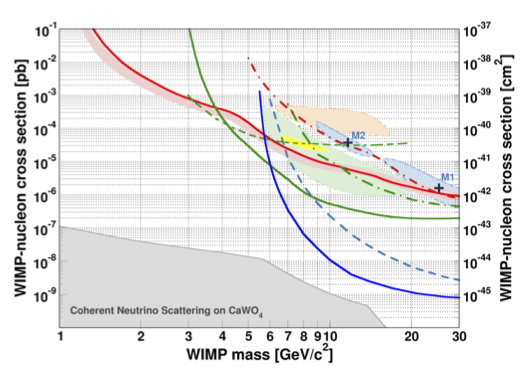 The neutrino wall can be very real if your uncertainties become dominated by the systematic uncertainty in the background. Then whatever you do to your detector (baring annual modulation and directional detection) the dark matter signal (or lack of signal) is completely hidden in your lack of knowledge about the background. I am more intrigued by billions of observed but unexplained MACHOs, which may be primordial black holes. And 100s of billions of unbound planetary-mass "nomads" in unknown physical states, which may be primordial black holes. And the newly discovered mystery population of astrophysical objects that is producing something roughly on the order of 10,000 fast radio bursts per day!!! I think the DM enigma has remained an enigma for so long because it is something we have not, or only superficially, considered. what about the WW excess ? Any take on the developing story ? Is there a story? It has never looked very convincing, given the large theoretical uncertainties and the fact most of the excess was at small pT. Now after arXiv:1407.4481, and arXiv:1407.4537 I think it's time move on. A key issue, of course, in terms of hypothesis rejection or acceptance is what kind of cross section of interaction we would expect in various dark matter models. Truly collisionless dark matter, of course, can't be detected at all, and the same cross section as neutrinos would be a plausible benchmark. But, I haven't seen a very good discussion of the expected cross section of interaction phenomenology of various dark matter models on terms that can be compared apples to apples to the direct dark matter detection exclusions. The matter axis is pretty clear, but the cross section axis, not so much. The solar neutrino flux decays as the inverse square of the distance from the sun, so the obvious solution is to get an insane billionaire to fund construction of an underground lab on Pluto. "The solar neutrino flux decays as the inverse square of the distance from the sun, so the obvious solution is to get an insane billionaire to fund construction of an underground lab on Pluto." Maybe just an infertile one. People with kids like to create dynasties, but people with lots of money and no kids do all sorts of cool stuff with their estates. And, it isn't as it you'd need a manned mission. It's amazing what can be done on the cheap with the right kind of inventor crew and robots. I consider the WIMP assumption long ruled out. Too many troubles for the Galaxy, I hate to spoil it for just a dark matter idea.